It may be cold outside, but winning some prizes may warm you up! 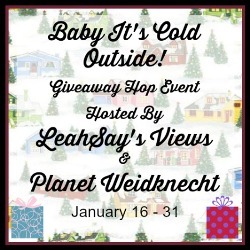 Visit each of the participating blogs listed below and enter all the giveaways. plus a $15 Amazon Gift Card. January is Slow Cooker Month and Cathy Mitchell has created a wonderful book of recipes that make cooking in the CrockPot even easier. This Dump Meals Cookbook features over 100 recipes with very clear instructions and lots of full color photographs. It is a hardback book, so it's very sturdy and the wire-bound pages allow the pages to fall completely open on the countertop while you're preparing. Cathy Mitchell has been cooking for over 60 years and she loves simple recipes, just like I do. The categories in the book include: Cathy's Favorites; Soups, Stews and Chilis; Chicken Favorites; Bountiful Beef; Pleasing Pork; Spectacular Sides; and Sweet Treats. In the back of the book, I found an alphabetical index and a metric conversion chart. Each recipe is five ingredients or less, so cooking in my CrockPot just got even simpler. There's no easier way to cook and slow cooking makes the house smell good all day. The Dump Meals Cookbook is a great resource to have in your kitchen. It's a great gift idea too! Order the CrockPot Dump Meals Cookbook HERE! Enter below to win this fabulous cookbook, plus a $15 Amazon Gift Card to purchase some spices! Just fill in the giveaway form below for your chance to win. Giveaway is open to US residents ages 18 and up. 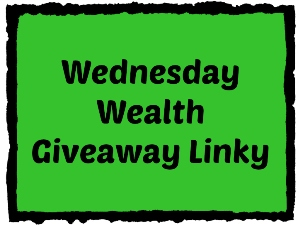 Giveaway ends on January 31, 2016. Good luck! We all take a bath or shower every day anyway, so make it something luxurious and enjoyable! The winter wreaks havoc on my skin and I'm usually left with flaky, itchy skin. I've been using these WinnieBelle bath and body products for about a week and my skin is super soft, even in the middle of winter! WinnieBelle products offer amazing scents that I haven't seen anywhere else! I received Bath Salts in three incredible scents - Lucky Charms, Rosemary and Lavender, and Snickers Coffee. I also received a Butter Cream Whipped Soap and a Birthday Cake Lip Balm. In my package, there were also two Face Masks in Mint Chocolate and Sleepytime, which arrive powdered in a tin (and cute carry bag) and are easily mixed with water to create a face mask. I received Rosemary and Lavender Healing Salve, Secret Kisses Bubble Bath, and Night Blooming Jasmine Lotion. I also got two chic glass hearts filled with Pumpkin Pie Body Scrub and Strawberry Vanilla Body Scrub. Indulge your senses without calories! I have been in bathing heaven all week long!!! I have experienced each one of these products and think they are fabulous. They smell absolutely amazing, leave my skin super soft, and are a much more affordable option than a spa visit. There are a lot more scents to choose from on their website, so you can choose the ones that most appeal to your nose. I definitely recommend WinnieBelle products! Disclosure: I was provided entertainment at no charge. Located in the Lakeway area of Austin, Texas, you will find the newest family entertainment center called High 5. They are located at 1502 Ranch Rd 620 S. High 5 offers bowling, laser tag, and a game arcade, plus a full service restaurant, lounge and bar. High 5 owners, Scott and Jenny Emley, have created a wonderful gathering place for you to get together with friends and family of all ages. My husband and I attended their "soft" grand opening on Saturday night, but as of today, they are open to everyone. We found they have plenty of staff on hand and everyone was very friendly and helpful. There are both small and large gathering spots throughout the center. The bowling balls are all organized by size and color, making it simple to find exactly the bowling ball you need. Sign up for their leagues or take a bowling class! You can grab beer, mixed drinks, or sodas at the bar. You can also choose to have dinner at the full service restaurant, with gourmet American choices like pizza and burgers. The game arcade offers games for all ages. My husband's favorites are the racing games and the shooting games. He also enjoyed beating me at air hockey, but it was a close game! High 5 offers redemption gaming, meaning you can earn tickets from games and turn them in for prizes. We also discovered the largest "claw" game we'd ever seen! We arrived early to take photos without the crowds, but by the end of the night the entire center was filled with families having a wonderful time. Their state of the art laser tag area offers viewing on the screen outside the doors. The two-story arena looks like great fun. High 5 is also a fabulous place for private events where you can book your celebrations, corporate events, or lock-ins. They even have a private bowling area upstairs with its own bar. There's plenty to see and do at High 5, so don't miss Austin's newest family entertainment center. By the way, I bowled my worst game EVER on Saturday night, but I had a fabulous time!